If you’re wearing braces, then you know they are working hard to straighten your teeth. However, those hard-working braces are also preventing you from easily cleaning your teeth. It is essential that you put some extra attention into preventing tooth decay while wearing your braces. When your braces are finally removed by Dr. Cohanim, you want a beautiful, white smile, not decayed or stained teeth. Here, we’ve listed the five best ways to ensure you have the smile you’ve always dreamed of once your braces are gone. A regular toothbrush just doesn’t cut it when you are wearing braces. You also need to use an interdental toothbrush so that you can effectively clean behind the braces. According to HealthGuidance.org, this type of brush has bristles that are shaped like a Christmas tree that can remove food residue in the braces and on the teeth. We also recommend using a WaterPik, with its highly pressurized pulsating water, to help get all of those hard-to-reach places. Since braces block food from naturally escaping your teeth after eating, it’s important that you take the time to brush and floss after every meal. The less time food has to sit on your teeth, the less likely it is to cause decay. This may seem like an inconvenience, but trust us, when you get your braces off, you will be very glad you brushed after every meal. Even after properly brushing and flossing, there are probably some food particles in your braces. A fluoride mouth rinse is the best way to ensure that every bit of food is removed after meals. If you do not have a mouth rinse available, we suggest using water — it’s better than nothing. 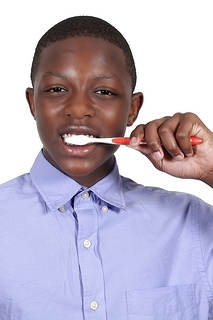 Prevention is definitely the best medicine when it comes to avoiding tooth decay. If you can nix decay-causing sugary foods from the outset, we promise you’ll spend less time trying to treat problems in the future. Visit your dentist regularly while you are wearing braces. Our office recommends a thorough cleaning every three to six months. Let our Seattle, WA office know if you have questions about your oral health while in braces – our entire team at Cohanim Smileworks is here to make sure your teeth are as beautifully straight as they are healthy! Filed under About Our Office by Dr Robert Cohanim on Oct 10th, 2013 .